Arundo maxima Forssk., Arundo versicolor P. Mill, Cynodon donax (L.) Raspail, Donax arundinaceus P. Beauv. (Bed), Donax donax (L.) Asch. & Graebn. The giant reed (Arundo donax L.) is a very tall herbaceous grass, common and even invasive in the Mediterranean Basin and the tropics. It has a poor palatability and nutritional value, except when young. Arundo donax is one of the tallest erect herbaceous grasses, growing to a height of 2 to 6 (up to 10) m. It is a perennial, semiaquatic rhizomatous plant that forms clumps and dense swards. Its short rhizomes form compact bundles that grow into an extensive fibrous root system. The culms, which originate from the rhizomes, can be up to 1-4 cm in diameter. They are erect, hollow with thick (2-7 mm) siliceous walls, smooth, glossy green in colour when young and yellow at maturity or during winter or droughts (Clayton et al., 2012; CABI, 2014; Quattrocchi, 2006). The leaves are alternately arranged with linear-lanceolate and smooth leaf-blades, blue-green in colour and 20-80 cm long x 1-7 cm broad. The inflorescence, borne at the apex of the culms, is a compact silky-hairy feathery plume-like panicle, 30-60 cm long x 5-10 cm broad. The fertile spikelets are pedicellated, solitary and hairy (hairs up to 7 mm long). The fruits are ovoid caryopsis, 2 mm long (Clayton et al., 2012; CABI, 2014; Quattrocchi, 2006). Arundo donax may be difficult to distinguish from other large reeds, such as the common reed (Phragmites australis) or the Burma reed (Neyraudia reynaudiana), but it has broader leaf blades (eFloras, 2014). The giant reed is a multi-purpose grass. Ancien Egyptians used it to line grain storage rooms and to wrap mummies (CABI, 2014), while Ancient Romans used it to make arrows and pipe instruments (Pliny the Elder, 77-79). The giant reed is still planted to produce high quality reeds for musical instruments such as bassoons and bagpipes (CABI, 2014). Its cellulose is used to make rayon and paper, and the plant is used for basketry, building materials, walking sticks, etc. The giand reed has some potential as biofuel, which may help to reduce its negative environmental impact outside its native range (eFloras, 2014; CABI, 2014). The giant reed is also used as an ornamental, live fence and windbreak, and may help controlling erosion by stabilizing banks or channelizing water courses (Nitin Kamboj, 2010; CABI, 2014). It is considered as a potential candidate for phytoremediation (Nsanganwimana et al., 2013). The young shoots and leaves are edible by humans. The rhizomes can be roasted or boiled, or ground to make bread. They are used in ethnomedicine and contain alkaloids with potential medical properties (Duke, 1983; CABI, 2014). The giant reed is readily browsed by cattle when young but cannot produce valuable forage as it matures very quickly and soon becomes unpalatable (Quattrocchi, 2006; CABI, 2014). 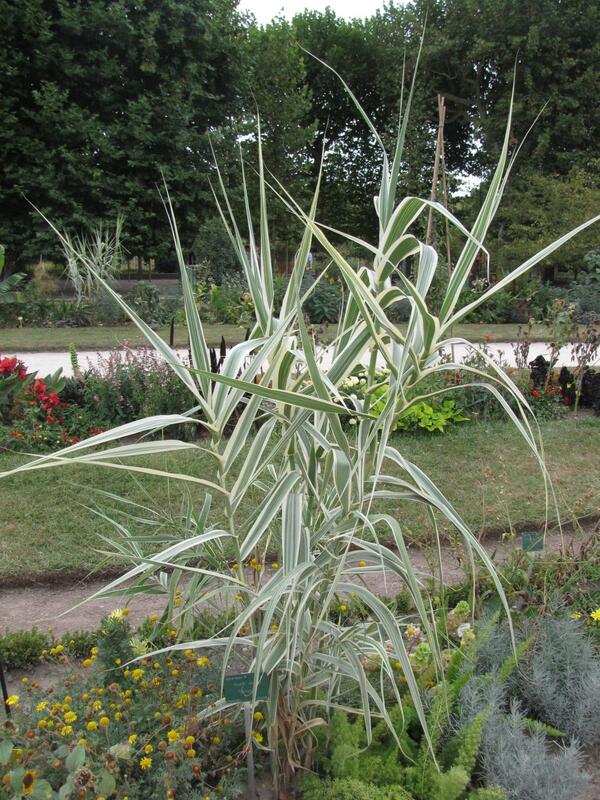 Arundo donax may be a native of the tropical or Mediterranean regions of Eurasia, or it may have originated from Southern Asia and then been introduced to Europe. It was used by the Egyptians 7000 years ago. It is now widespread in the Mediterranean Basin and all tropical areas worldwide. It was introduced to the Americas as an ornamental plant and escaped into the wild. It is naturalized and invasive in subtropical USA, Mexico, the Caribbean Islands, South America, the Pacific Islands, Australia, New Zealand and South Africa (Csurhes, 2009; CABI, 2014; Ryan, 2001). Arundo donax is a semiaquatic plant found in damp areas or riparian habitats such as riverbanks, lakesides, edges of stream and ponds. It does well in moist disturbed places, such as flood plains, coastal areas, roadsides, marshes, sand dunes near seashores or along irrigation ditches and waste ground (Quattrocchi, 2006). In California, it is abundant in large low-gradient river areas, where it covers between 13 and 40% of the surface area (CIPC, 2011). Arundo donax does well under warm temperate and subtropical climates but stops flourishing under a true tropical climate. It has little tolerance to frost (Perdue, 1958 cited by Csurhes, 2009) and does not survive in areas with prolonged or regular freezing temperatures (DiTomaso et al., 2003 cited by Csurhes, 2009). In wetter regions, such as the Fiji Islands, Arundo donax can be found away from riparian areas up to an altitude of 200 m. In the Himalayas, it has been found as high as 2400 m (Perdue, 1958 cited by Csurhes, 2009). Arundo donax grows in a wide range of soils, from coarse sands or gravelly soils to heavy clays and river sediments, and from freshwater to semi-saline soils on brackish estuaries, as it has a degree of salt tolerance (CABI, 2014). 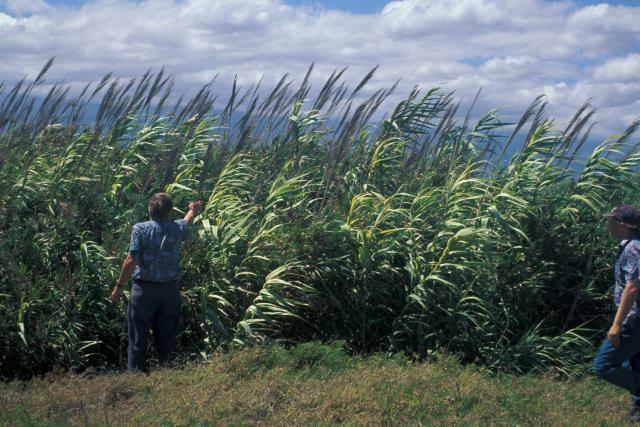 Because Arundo donax is usually considered a noxious weed, most efforts are dedicated to controlling it and there are few trials dedicated to its management as a forage (see Environmental impact below). It is a highly productive species, yielding from 30-40 t/ha/year biomass in low yield areas such as Greece or Spain, to 171 t/ha/year in the USA (eFloras, 2014; CIPC, 2011). Grazing of the young shoots and leaves, which are the only parts palatable to livestock, may help to control its development during the dry season (USDA, 2012). 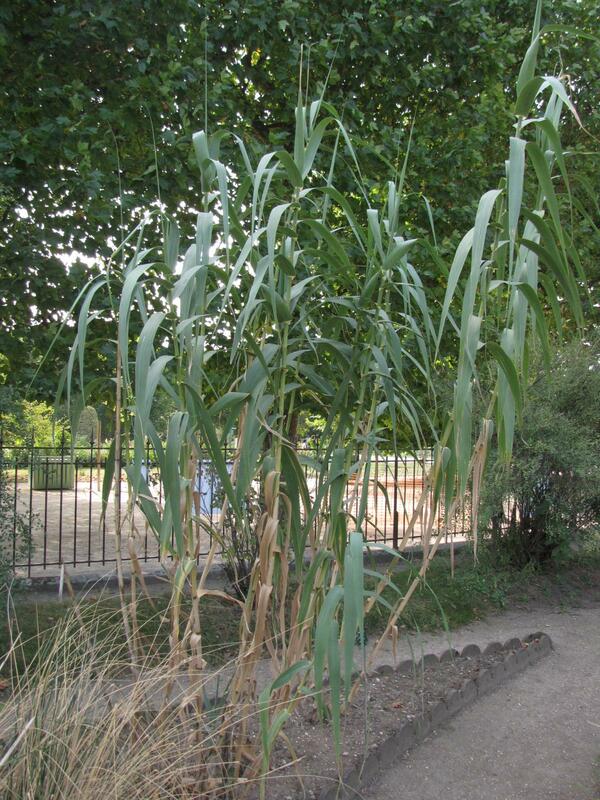 The propagation of Arundo donax is generally not of concern in its native range, but may become an important issue in areas where it has been naturalized, such as the subtropical USA (CABI, 2014; Ryan, 2001). It outcompetes a wide range of native species and quickly becomes the dominant species in riparian areas where it forms dense monospecific thickets (Scott, 1994). For instance, the giant reed was reported to dominate 68% of the vegetation of the Santa Ana River Basin in California (Douthit, 1994). This ability to outcompete other species is reinforced by its response to fire: Arundo donax produces year-round large amounts of flammable material that increase the intensity of fires, but, because of its rhizomes, it quickly re-sprouts after fires, preventing the re-establishment of other species (Scott, 1994). The disappearance of native plant species due to Arundo donax alters biodiversity. Not only bird species that depend on native plant species for feeding or nesting lose their natural habitat, but the giant reed also provides little shade unable to cool in-stream habitats for fish and invertebrates (Ryan, 2001). The giant reed also provides a habitat for the invasive Norway rat (Rattus norvegicus), which has caused or contributed to the extinction or reduction of native range animal species (CABI, 2014). Cattle, sheep and goats may be useful to control the giant reed population. For instance, Angora goats have been partially successful in reducing this plant in Southern California (Daar, 1983). However, grazing is unlikely to reduce population size significantly (USDA, 2012). The giant reed uses more water than native plants, lowering groundwater tables (CABI, 2014). The extensive root system of Arundo donax inhibits the movement of water and sediments. In periods of flooding, reed thickets force flood waters out of the primary channels. The stems and rhizomes break off and are deposited in drainage systems, under bridges, in agricultural ditches and other flood control systems, thus obstructing them (CABI, 2014). Arundo donax was planted in California in the late 1700s and early 1800s for erosion control in drainage canals and as windbreaks (Csurhes, 2009). It is still used in gardens for erosion control (Ryan, 2001). In the USA, in spite of its invasiveness, the Environment Protection Agency agreed that the giant reed can be used as a source of biofuel under the Renewable Fuel Standard Program provided users respect the Risk Management Plan for early detection and rapid response to potential spread (EPA, 2013). The giant reed can be valuable for wastewater treatment. In Portugal, it was effective in the treatment of tannery wastewater (Calheiros et al., 2012). In Sicily, giant reeds planted in constructed wetland systems significantly removed pollutants from urban wastewater, and the treated water was used to irrigate parkland areas (Leto et al., 2013). Arundo donax forage has a poor nutritive value. It is rich in fibre (NDF more than 65% DM, lignin 7-8% DM), with a low crude protein content (about 11% DM). Some alkaloids, such as tryptamine, have been found in the flowers of Arundo donax (Smith, 1977; Ghosal et al., 1971). Arundo donax is a reservoir for the cattle tick Rhipicephalus (Boophilus) spp., a key vector of protozoa that cause bovine babesiosis (Racelis et al., 2012). The giant reed has a rather poor nutritive value and its use for forage is limited. However, ruminants have been used with variable success in attempts to control its invasiveness (Daar, 1983; USDA, 2012). Giant reed forage has limited palatability to ruminants. Younger plants (50-100 cm height) are more palatable and of better nutritive value than older plants (Shehata et al., 2006). Giant reed silage is as palatable as maize silage, and is better consumed than the giant reed hay or berseem hay (Ahmed et al., 2011b; Shehata et al., 2006). 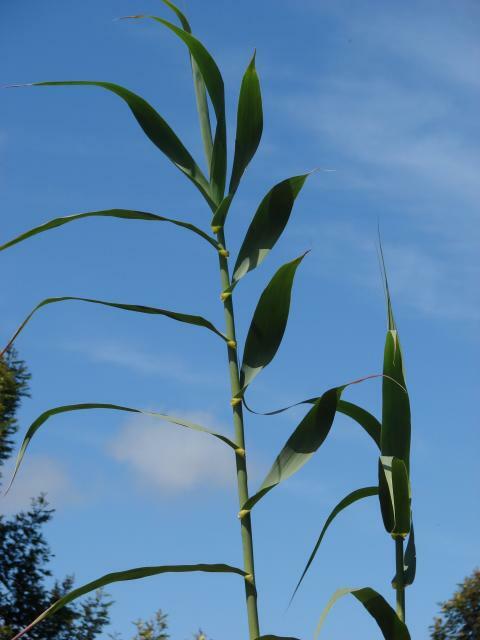 Due to its high fibre and low protein content, Arundo donax foliage is poorly digested. Reported values from Egypt were about 47-51% (Tagel-Din, 1990) and 50-52% (Ahmed et al., 2011b) for DM digestibility, and about 54-56% for OM digestibility (Ahmed et al., 2011b). However, a higher DM digestibility of 69% was reported in an early trial in India (Talapatra, 1950). Several trials in Egypt have studied the value of the giant reed, either ensiled or fresh. Fresh giant reed forage and giant reed silage (ensiled with 3% molasses on a fresh weight basis) were better digested by Rahmani sheep than giant reed hay or berseem hay (Ahmed et al., 2011b; Shehata et al., 2006). This can be explained by a higher microbial activity in the rumen with fresh or ensiled forages compared to the hays: total volatile fatty acid concentration and microbial protein production were higher 4 h after feeding (Ahmed et al., 2011b). Giant reed silage was found as digestible as maize silage (Abo-Donia et al., 2009; Shehata et al., 2006). At the time of writing (2014), trials on the utilization of Arundo donax in cattle have only concerned its veterinary properties. All trials took place in India. Arundo donax extracts had anthelmintic properties (around 55% of efficacy) against gastrointestinal parasites (Ascaris sp., Oesophagostomum sp. and Paramphistomum sp.) in cattle (Sharatkumar et al., 2004). A commercial bolus made of a mixture of several powdered plants including Arundo donax improved milk yield in dairy cows, which was attributed to the presence of components reported to be galactogogues (Baig et al., 2009; Behera et al., 2013). In Egyptian lambs, ensiled and fresh giant reed forage gave better fattening performance than giant reed hay, the latter being close to berseem hay in that respect (Ahmed et al., 2009). Dressing values, carcass weight and more generally carcass quality (shoulder and leg cuts) were significantly improved with silage or fresh giant reed compared to berseem hay and giant reed hay (Ahmed et al., 2011a). Blood parameters were similar for all the treatments, except red blood cells which were higher for the fresh or ensiled reeds (Ahmed et al., 2009). Giant reed silage had no adverse effects when fed with whole dates and olive cake in order to solve the shortage of green fodder in Egyptian oases (Shwerab et al., 2010). In Egyptian Rahmani rams, giant reed silage gave a better reproductive performance than fresh reeds and reed hay, and the results obtained were closed to those observed with berseem hay (Ahmed et al., 2009). In Egypt, giant reed silage or fresh forage fed to Zaraibi goats gave higher milk yields than giant reed hay. The milk composition did not differ between diets (Ahmed et al., 2011b; Shehata et al., 2006). At the time of writing (2014), no publication was available on the use of Arundo donax in rabbit feeding.